The Norwegian treble Aksel Rykkvin released a disc of baroque arias on Signum Classics in 2016 [see my review], now this latest disc (recorded in July 2017) captures Rykkvin's voice just before it changed (since Autumn 2017 he has sung as a baritone). The repertoire is music by Handel and Rameau, with an emphasis on both the voice and the trumpet, with Rykkvin performing with Mark Bennett (trumpet) and the MIN Ensemble (ensemble director Lazar Miletic). The MIN Ensemble is a modern instrument chamber orchestra from Norway, and on this disc, it combines its modern instruments with baroque trumpet, flute, lute and harpsichord to give a very engaging account of this music, most of which fairly dances off the page. The music is arranged effectively in two continuous sequences, first Handel and then Rameau, separated by an Albinoni aria and a Ciaccona by Czech composer Philipp Jakob Rittler. Some of the music has been arranged for the forces so that the disc opens with music originally in Handel's Water Music, now adjusted to feature a pair of trumpets. For the Handel sequence we move from the fanfares of the Water Music, through the opening voice and trumpet duet Eternal Source of Light Divine from the Birthday Ode to Queen Anne, the Passacaille from the Trio Sonata in G major, the aria What passion cannot music aise and quell from The Ode for St Cecilia's Day, and finally Alla caccia from the cantata Diana Cacciatrice. For Rameau, we start with orchestral music from Hippolyte et Aricie and Les Boreades, then the aria Tristes apprets from Castor et Pollux, then music from Zoroastre and Platee, the aria Je ne sais quel ennui me presse from Nais and finally the Chaconne from Les Indes galantes. Aksel Rykkvin only sings on six tracks out of fourteen, but inevitably focus will be on him particularly as this seems to be his final commercial recording as a treble. He has an enviable technique, with commendable passagework and a fine trill. He sings with bright forward tone, and a very poised, mature sense of style. Bennett proves a discreet partner in Eternal Source of Light Divine, modulating his tone to balance Rykkvin's to fine effect. The aria from the Ode to St Cecilia's Day includes a fine cello obbligato, though here occasionally Rykkvin sounds a little careful. But in the final Handel aria, from Diana Cacciatrice we have a wonderfully engaging and positively toe-tapping performance, with strong runs. The perky aria Vien con nuova orribil guerra from Tomaso Albinoni's La statira is rousingly martial, complete with trumpet. Triste apprets from Rameau's Castor et Pollux is perhaps a little light sounding, inevitable given the style of Rykkvin's voice, and he sings with stylish poise rather than deep intensity, but it is a fine achievement. His final aria is Je ne sais quel ennui me presse from Rameau's Nais is equally appealing. 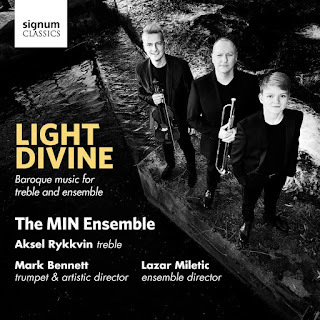 Around these, the ensemble gives us some finely engaging orchestral performances and there is not just imaginative trumpet playing from Mark Bennett and Simon Munday, but also fabulous bassoon moments in the Rameau. The result makes this disc an enjoyable melange rather than simply being a treble showpiece. It can certainly be recommended, even for those not particularly interested in the career of a Norwegian treble, but the extent of Rykkvin's achievement can be judged from the video, which makes apparent the remarkable combination of technique, style and extreme youth.